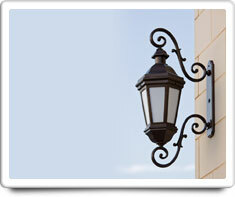 Outdoor Lighting are light fixtures on the outside of your home. These light fixtures can be attached directly to your home, or they can be mounted on posts and columns in your yard or along your Driveway. If any of your Outdoor Lighting is just used temporarily on a seasonal basis during the holidays, then you should also put a checkmark for 'Holiday Lighting' as part of your home features in your Home Wizard app. Changing outside lighting becomes more difficult during bad winter weather, so it should be checked prior to the winter. Shown in the 'Routine Care' section are the recommended routine maintenance tasks for your outdoor lighting. The 'Q & A' section shows answers to common questions. And the 'Articles' section provides helpful articles about your outdoor lighting.